Combine flour, granulated sugar, cocoa powder, cinnamon, and salt in the bowl of an electric mixer. Add Marsala and oil, and beat on medium speed until dough comes together. Using your hands, knead dough on a lightly floured work surface until smooth and elastic, about 15 minutes. Wrap in plastic, and let rest 30 minutes. Divide dough into 2 pieces. Pass 1 piece of dough through the widest setting of a pasta machine (keep remaining pieces covered) OR roll out into a thin sheet of dough. Continue passing through narrower settings until it is the thickness of a dime. Lay on a floured work surface. Cut out rounds with a 3 1/4-inch cutter. Gather scraps and reroll. Pour enough oil into a large, heavy saucepan to come about 4 inches up sides. Heat over medium heat until a deep-fry thermometer registers 380 degrees. Wrap each round of dough around a 3 3/4-inch-long cannoli form, sealing with a dab of egg white. Working in batches of 3 or 4, fry until golden, about 1 minute. Using a wire skimmer or tongs, transfer to paper towels, and let cool 5 minutes. Carefully slide out forms, and let shells cool. Continue rolling, cutting, and frying the remaining dough. Melt chocolate in a heatproof bowl set over a pan of simmering water. 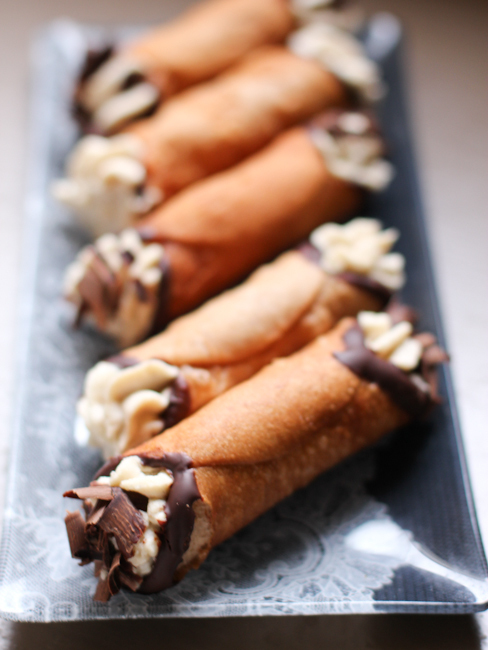 Dip ends of cannoli shells in melted chocolate. Let set 15 minutes on parchment paper. Cover and refrigerate until ready to use (at least a couple of hours). When ready to serve, use a ziploc bag (cut the corner) or pastry bag with 1/2 inch star tip. Pipe filling into one end of a shell to the center, then into other end. Repeat with remaining shells and filling. Dust with confectioners' sugar, and serve immediately. Let the filling smoosh out of each end of the shells, just a tad. Some people sprinkle powdered sugar on top right before serving or dip the ends into chocolate shavings.